The Summertime is marked full of fun parties and events. Everyone wants to take full advantage of the warm weather, sunshine and long days. The event that seems to pop up the most are weddings. Who doesn’t love a Summertime wedding? The only problem is when you have to decide what to wear. 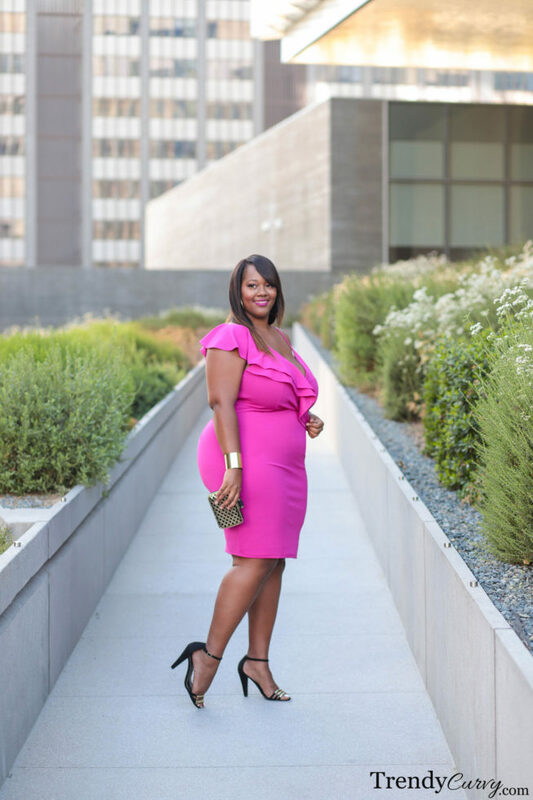 Formal wear for plus size women is already difficult to find but finding a special occasion dress that is also Summer proof can seem impossible. It has to be the perfect blend of comfort, style and functionality (the ultimate trifecta). I’ve put together some of my favorite styles for the season along with this chic ruffle dress to hopefully help your process a little bit easier. And of course, these looks don’t have to solely be worn at weddings but they can translate to any special event that you have coming up. So let’s start off with the dress that I’m wearing. Summer wedding attire and just Summer fashion in general is all about color. This hot pink color immediately caught my eye and was the perfect hue for the season. On top of the color, I absolutely loved the ruffle detail that gives off a very fun & flirty vibe. Below I’ve listed a few other dresses that I think would be perfect to end this Summer dress season. Love is in the air so your outfit should be loved as well! I saw this dress on you and I got it the same day! I can’t wait to wear it as my birthday outfit. THANK YOU SO VERY MUCH!!!!! Awww yayy! Hope you love it and happy early birthday!! I have to ask about undergarments. You always keep everything looking so smooth, care to share your secrets? Lovely dress! You are ooking gorgeous in this outfit. I am so inspired and want to try this. Thanks a lot for sharing.